If the thought of your baby turning one and taking a sudden leap into toddlerhood has you feeling all blue, then this is definitely the party for you! 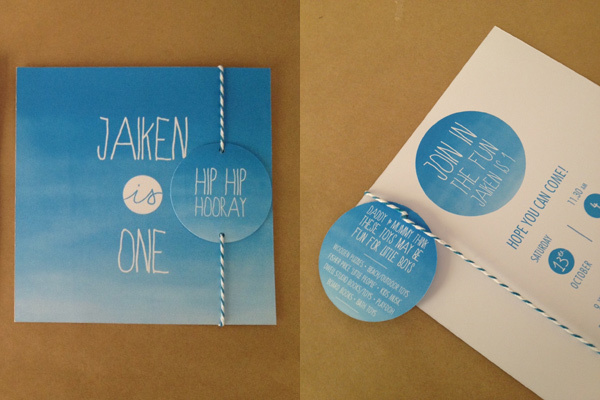 Mum Lyndall took the blue-for-boys theme to happy extremes when her little guy turned one recently, taking inspiration from Jaiken’s bluer-than-blue eyes to create a party where every little detail was spot on, starting with the invitation that was custom-designed by Pixels Plus Paper to match the blue ombre tone. We like the accompanying gift suggestion tag, a little bit of subtle help for guests who need a bit of prompting about what might be appropriate when it comes to toys for one-year-olds. See all the blue? It’s unmissably there in the blue tableclothes and servingware, as well as in much of the edible offerings over at the sweets table, with its abundance of macarons in not one, but three pretty shades of blue. They came from Sydney patisserie Sugar Egg Flour. If you’re curious about the flavours, Lyndall tells us they were vanilla bean, salted caramel and choc hazelnut. Bucketloads of blue lollies from party shop Sweet Style, mini blueberry meringue parfaits, star-shaped brownies and butterscotch popcorn in blue spotted cups from Pink Lemonade party boutique sat side-by-side with healthier fruit wands. Here’s an idea we totally love – the party table backdrop. 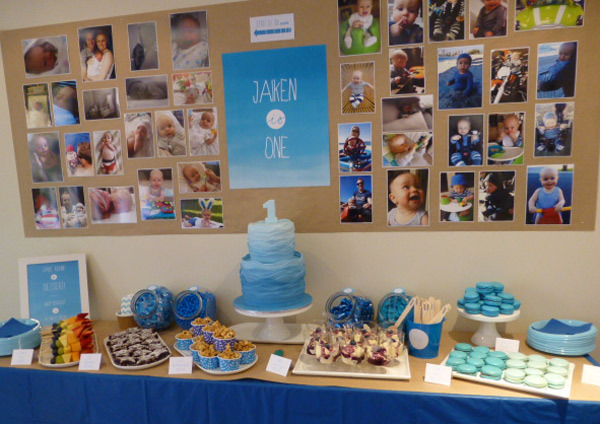 Lyndall chose a selection of her very favourite photos from Jaiken’s first year and had them enlarged and printed to create a photo wall for guests to admire. Very simple, very personal and very, very eye-catching. 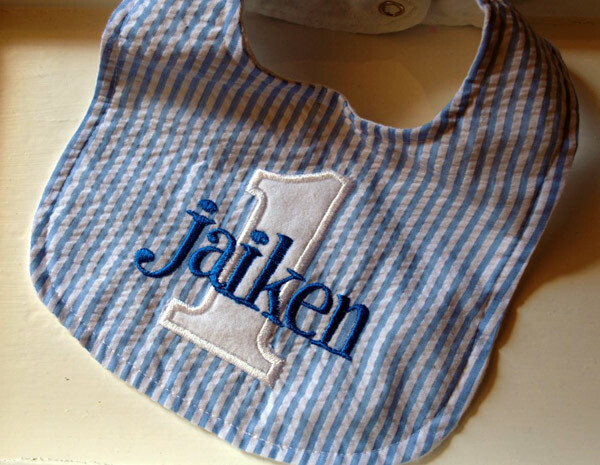 Another personal touch was the sweet bib made just for Jaiken by Dainty Couture (pictured top). 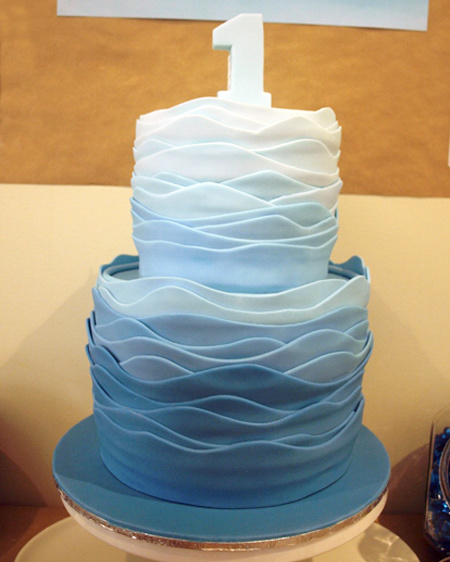 Of course, the piéce de résistance was the birthday cake, a marvellous blue ombre ruffled number from Simple Ingredients. A vanilla bean sponge layered with white chocolate ganache, Lyndall served it up to appreciative gifts with a scoop of honey macadamia ice cream. 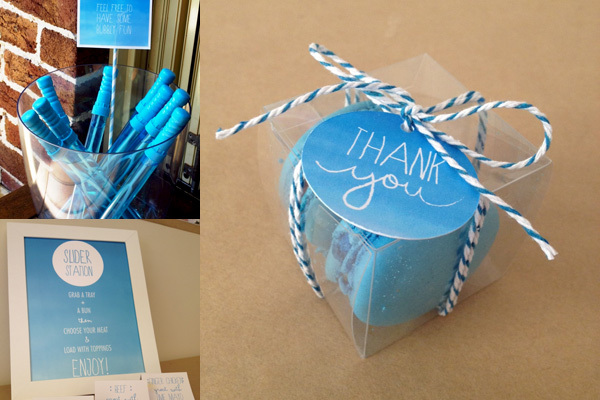 Most of the child guests were babies like Jaiken so rather than lolly bags, they all received a blue bubble wand to take home, zhuzhed with a little matching baker’s twine and personalised gift tags. Grown-ups received a cute box of macarons, displayed to twin perfection in little clear favour boxes from Jenny Pong Studio on Etsy, and as many lollies as they could fit into the blue chevron paper bags, another Sweet Style find. 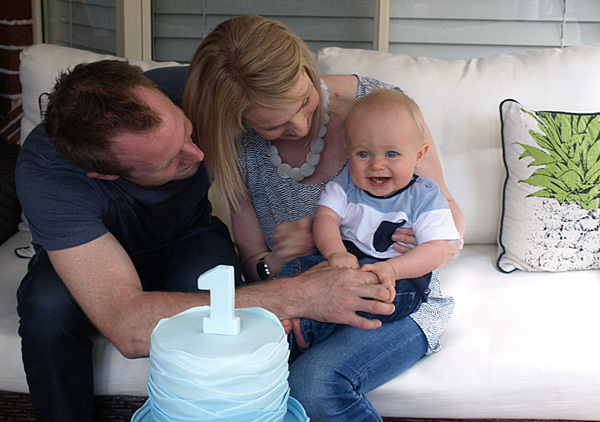 Now here’s the birthday boy enjoying the day with his doting parents – we can certainly see why people stop Lyndall in the street to comment on his eyes.